One oversight of many comics is that few college-age characters inhabit the social world and educational environment that would look familiar to real people in their age demographic. For example, in X-Men titles, characters like Armor and Karma are mostly holed up in the Jean Grey School campus, and ventures out into Salem Center are treated like occasional excursions. Selina Kyle recently got a cubicle job in a phone bank, but not much attention was given to her interactions with coworkers. We see much better depictions of post-teen characters on TV. Batgirl comes like a breath of fresh air. Barbara Gordon has just moved in with a new roommate, Frankie, into an apartment in Burnside. Burnside could be an exact stand-in for Bushwick, with its hipster vibe — Alysia Yeoh even makes a fixed-gear bike reference. A central plot point is the dating/trolling app Hooq, DC’s Tinder clone. Babs uses the app to track down a mysterious thief. You get the sense that Cameron Stewart and Brenden Fletcher understand this demographic, and actively try to immerse Babs in it. One of my favorite scenes is when Babs walks across the street, reading emails on her phone. In quick succession, she gets a disappointing email from the advisor of her graduate school program, an overdraft notice from her bank, and a concerned email from Alysia. Stewart and Fletcher use these emails to identify Babs’ life stage in a nutshell, and it’s a scene that is readily relatable. Babs Tarr perfectly captures Babs’ reaction to these everyday, mundane slices of life. Another scene that really shows off Tarr’s inventive eye for page layouts is when Babs walks through her photographic recollection of the previous night’s party. We see an overhead view of the apartment, with friends huddled over their phones on the couch, conversing over red cups while seated on the carpet, and bantering in the kitchen. Tarr, Stewart and Fletcher show they know what a party like this would look like, and the execution is impressive. Another effective artistic and narrative device is when Babs questions two people who were duped by a charmer they met on Hooq. The panels cut back and forth between the two forlorn individuals mid-sentence, creating a humorous account of the sketchy character’s past. We’ve seen this kind of interview cutting before — TV shows like Modern Family use it frequently — but Tarr, Stewart and Fletcher do it in a way that really seals our empathy for the interviewees. Tarr and colorist Maris Wicks draw body language and facial expressions in this scene that communicate the level of hurt these characters feel. I especially like the character Sevin’s crossed-arm lean against his desk, and how it reflects his guarded, resentful state. With the extensive task of introducing us to Babs’ new status quo — new student, new neighborhood, new supporting characters — Stewart and Fletcher handle the pacing with aplomb. Frankie is an energetic, outgoing character who presents the perfect foil to Babs’ more low-key side. Stewart and Fletcher write a number of scenes where Babs and Frankie interact in the apartment, trying to solve a mystery, discussing Hooq, and updating Babs’ style. Frankie receives the development that supporting characters in many titles lack. Also, unlike some characters (the brainy Alice Tesla in Catwoman comes to mind), Frankie isn’t identified by only one of her traits. This writing team is clearly committed to developing well-rounded characters, not just pushing the plot from crisis to crisis. One of Tarr and Wicks’ best pages is when Babs is fashioning her new costume. We see Babs painstakingly working with fabric paint and sewing supplies. The creative team has given a practical and completely understandable origin story to her new look. Her yellow Doc Martens boots are an especially appealing, signature element of her costume. Another highlight of Wicks’ work is in a fight scene in a dark park, panels are filled with bright orange, sunburned red, and electric pink backgrounds. The contrasts look fantastic, and heighten the energy of the conflict in that moment. 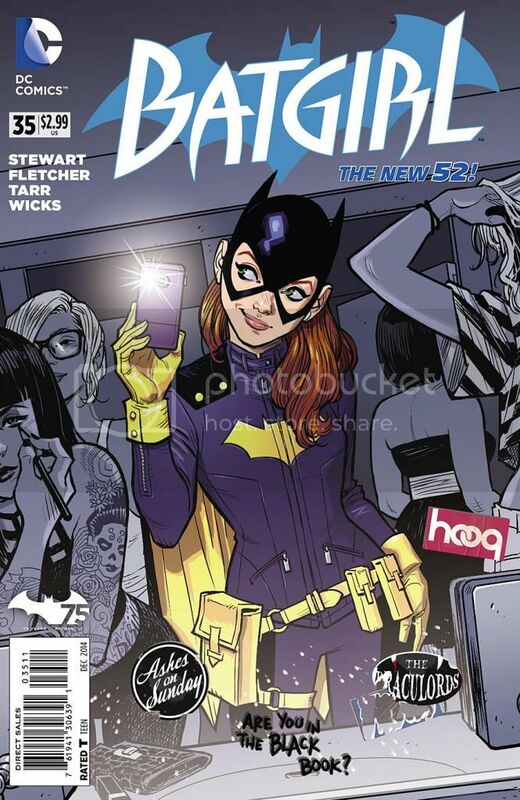 Batgirl #35 is like the start of fall semester at a new school: a new life chapter for Babs, and a clean entryway for readers to discover an enjoyable new story. This creative team recognizes what daily life is like for Babs and her roommates with an authenticity unparalleled in current comics.